The X-Men have taken over Snapchat, or at least their filters. The popular social media platform has partnered with Twentieth Century Fox to give users the opportunity to fulfill their childhood dreams of being a superhero — or supervillain — all through the magic of transformative lenses. In celebration of the release of “X-Men: Apocalypse,” the first-ever Lens takeover allows snapchatters to transform into their favorite mutants for the next 24 hours. And it’s a literal takeover, since all of the regular face warping lenses are temporarily gone and have been replaced with nine X-Men characters: Storm, Mystique, Beast, Professor X, Magneto, Quicksilver, Apocalypse, Cyclops and Nightcrawler. The promotion also includes the first-ever movie ticketing ad unit on Snapchat, allowing users to purchase tickets to “Apocalypse” through May 26 by swiping up on the ad. The ticketing unit is similar to the vertical video ads Snapchat users have been accustomed to seeing. Those who come across an “X-Men” ad within the Discover channels can swipe up on the screen and will be able to buy tickets through Fandango or MovieTickets. Users will also be able to view movie trailers and browse through other featured content all within the Snapchat app. “X-Men: Apocalypse” is the ninth installment of the blockbuster franchise, and hits theaters on May 27. Coming into "X-Men: Apocalypse," the weight of seven movies' (not counting "Deadpool") worth of storytelling might seem daunting, particularly with these other superhero universes we've had to keep track of over the years. But it's actually probably not as bad as you think! Let's take a look at the essentials you need going into the latest X-Film. Even though all seven live action "X-Men" movies we've been given over the past 16 years (again, not counting "Deadpool") are all technically part of a single continuity, most of them don't actually factor into the setup for "Apocalypse" for a couple reasons: "Apocalypse" is set in 1983, before the events of the first three movies and the second "Wolverine" spinoff; and the time travel shenanigans of "Days of Future Past" wrote those movies out of the timeline. "X-Men Origins: Wolverine" took place in in 1979, but in this timeline Wolverine's interactions with William Stryker and his Weapon X program went a bit differently than as seen in that film. In effect, "Days of Future Past" was a reboot, and so anything can happen from here -- what happens in "Apocalypse" doesn't have to set up those past "X-Men" movies that take place later, because this is not happening in that past. Confused? That's fine. Have a drink and we'll come back to that in a moment. When it comes to what you need to know for "X-Men: Apocalypse," we start with "X-Men: First Class," Matthew Vaughn's film about Professor Xavier, Magneto and Mystique in the 1960s, as they attempt to figure out what their place is in the world as mutants. "First Class" actually begins with a prologue way back in the 1940s, going back to Magneto, or Erik, as a child in a Nazi concentration camp during World War II. A man named Sebastian Shaw had noticed Erik's ability to manipulate metal -- Shaw kills Erik's mother to get him riled up enough to be able to use his powers. Meanwhile, a young Xavier meets a young Raven (Mystique), who will become his adopted sister. Over the next two decades, Shaw will assemble a small team of mutants to enact his vision of a world ruled by "superior" mutants rather than regular humans. They orchestrate the real event that we know as the Cuban Missile Crisis, which nearly caused nuclear war in 1962. Xavier and Raven, meanwhile, recognize the threat of Shaw and his team and works with the CIA to stop it, assembling their own mutant team -- the titular "first class" of X-Men, who train at Xavier's family mansion in England. Erik/Magneto, despite holding an ideology that's roughly in line with Shaw's, joins up with Xavier and friends for the sake of revenge. In the end, Xavier's X-Men are able to defeat Shaw and prevent a nuclear holocaust. But out of fear of their mutant powers, the Navies of the United States and Soviet Union briefly ally to try to wipe out the surviving mutants. The attempt is thwarted, though Xavier is injured and becomes paralyzed from the waist down. Magneto decides this incident means humans and mutants can never live in peace, and the mutants need to take a hardline stance. Several of the X-Men agree, including Raven, and they form their own splinter group at the end of the film. "Days of Future Past," the most recent "X-Men" film, opens in the year 2023 with a lot of faces we've known for a long time: Iceman, Wolverine, Storm and the old man versions of Professor X and Magneto in particular. A bunch of machines called sentinels are hellbent on wiping out mutants, and are doing a damn good job of it. Most of the X-Men are dead by this point, including Cyclops. The X-Men are able to stay ahead of them thanks to Kitty Pryde, who has the ability to sent a person's mind back in time -- whenever the sentinels attack, she sends somebody back to warn them that they're coming and they hightail it out of wherever they were holed up. Professor X and Magneto have determined that this whole chain of events was set in motion in 1973, when Mystique killed the anti-mutant CEO of Trask Industries, Bolivar Trask (pictured). Trask's murder would cause the government to fund Trask's sentinel project, eventually bringing about this crazy world war they're involved in now. So they decide to send Wolverine back in time to make the younger X and Magneto get along so they can stop Mystique from killing Trask. In the past, a young William Stryker is working for Trask rounding up mutants for experimentation, including going after a few who are serving in Vietnam. Stryker is someone we've met a couple times before, as the villain in "X2" (played by Brian Cox) and the man responsible for Wolverine's adamantium skeleton in "X-Men Origins: Wolverine" (played by Danny Huston). Mystique helps the mutants in Vietnam escape, however. Professor X, Wolverine and Beast enlist the aid of the super speedy Quicksilver to break Magneto out of a secret CIA prison, and they travel to Paris to stop Mystique from killing Trask. Magneto tries to kill Mystique, but Beast stops him. This mutant showdown is very public, though, and incites fear of a mutant threat. So President Nixon agrees to pay for Trask's sentinel program, but -- aha! -- Trask has already constructed prototypes, which are unveiled in Washington, D.C. in a ceremony on the White House lawn. Magneto manages to hijack the sentinels, and uses them to attack the humans present rather than mutants. And it's the X-Men who save the president and Trask. Nixon cancels the Sentinel funding and Trask ends up in prison for selling government secrets. It all works out, sort of, and the result is a more idyllic future in which all those "X-Men" movies set in the modern era ("X-Men," "X2," "The Last Stand," both "Wolverine" movies) never happened. Jean Grey, who died in "X-Men: The Last Stand," is still alive, along with all the others we'd seen die in "Days of Future Past," which is how we know the retcon is complete. 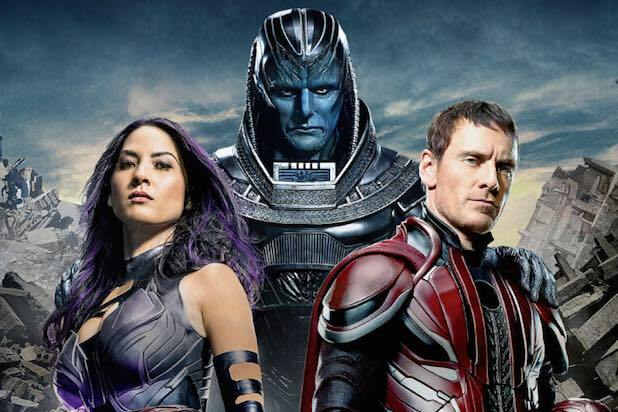 And this is where "X-Men: Apocalypse" picks up, a decade later. It's a new world in which most anything can happen -- though of course all the people who were alive in 2023 at the end of "Days of Future Past" will have to survive. But otherwise the slate is clean. So if you want to refresh your memory before heading to the theater, all you really need to revisit are "First Class" and "Days of Future Past."